Belledonne Suite & Gallery is a historic mansion inspired to an eclectic and timeless style. 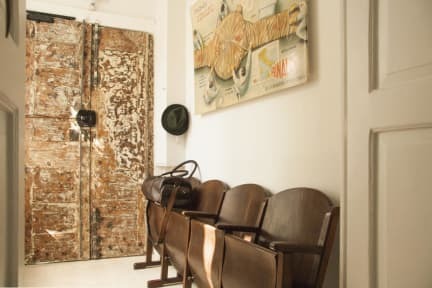 The property is a guesthouse which offers a selection of suggestive Suites, perfect for both short and long stays, where to find the warmth of your own home in the hearth of Naples. Going through an entrance illuminated by a large window which overlooks the building courtyard of the early ‘900, you have access to the beautiful living room. This part of the mansion is used for temporary art exhibitions too, which end to be the characterising part of the furniture giving the setting an international touch. From the common space you get to the suite through an external gallery which overlooks the courtyard, just like the Neapolitan traditional homes. Belledonne Suite & Gallery is a sophisticated Bed and breakfast situated in the hearth of the city centre, a few steps away from Piazza dei Martiri, Piazza del Plebiscito, Caracciolo seafront and the historic centre of the city. The rooms are all different from each other. 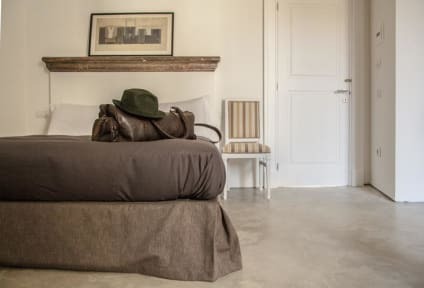 Industrial floors, raw iron and recycled furniture are the elements that give the touch of uniqueness and intimate hospitality to the single rooms. All rooms are soundproofed and air-conditioned, also equipped with the traditional services such as: bathroom, safe, courtesy kit and custom linens. Belledonne Suite & Gallery is a family-friendly hotel, so are available on request cradles, cots and high chairs for younger guests. Also allowed small pets.